We Mean Business > 24 D I V E R S I T Y W O M A N S p r i n g 2 0 1 8 d i v e r s i t y w o m a n . c o m Somehow, millennials and baby boomers are going to have to learn to work togeth- er. Many boomers are not retiring anytime soon, and according to a 2016 Pew study, millennials are on the verge of surpass- ing boomers as the largest generation in the United States—which means they will increasingly move into the higher eche- lons of leadership, either working with or super- vising boomers. Some millennial man- agers, like Ritchey, see the mixing of generations as a positive development, giving both generations the opportunity to learn from each other. She notes that, counter to some assumptions, her boomer employees are even more open to new ideas and work- place tools, which she finds refreshing and tries to encourage. "I've been able to teach them new au- dio production skills and best practices in terms of social media," she explains. One boomer colleague was cautious at first but soon warmed up to using the team's Slack channel when she understood how much it would cut down on email. "I find boomers more eager than some of the younger people on my team—even my own peers—in wanting to try new things," Ritchey says. 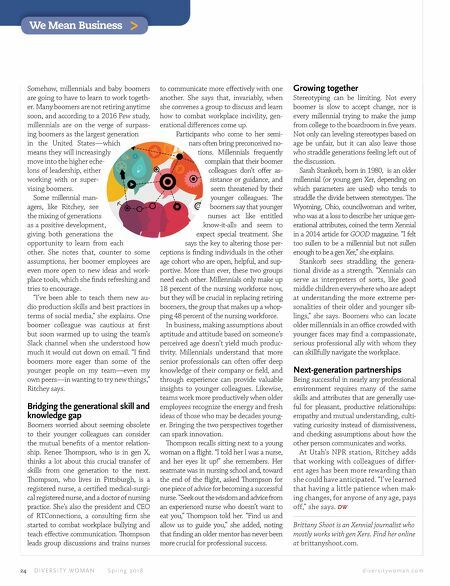 Bridging the generational skill and knowledge gap Boomers worried about seeming obsolete to their younger colleagues can consider the mutual benefits of a mentor relation- ship. Renee ompson, who is in gen X, thinks a lot about this crucial transfer of skills from one generation to the next. ompson, who lives in Pittsburgh, is a registered nurse, a certified medical-surgi- cal registered nurse, and a doctor of nursing practice. She's also the president and CEO of RTConnections, a consulting firm she started to combat workplace bullying and teach effective communication. ompson leads group discussions and trains nurses to communicate more effectively with one another. She says that, invariably, when she convenes a group to discuss and learn how to combat workplace incivility, gen- erational differences come up. Participants who come to her semi- nars often bring preconceived no- tions. Millennials frequently complain that their boomer colleagues don't offer as- sistance or guidance, and seem threatened by their younger colleagues. e boomers say that younger nurses act like entitled know-it-alls and seem to expect special treatment. She says the key to altering those per- ceptions is finding individuals in the other age cohort who are open, helpful, and sup- portive. More than ever, these two groups need each other. Millennials only make up 18 percent of the nursing workforce now, but they will be crucial in replacing retiring boomers, the group that makes up a whop- ping 48 percent of the nursing workforce. In business, making assumptions about aptitude and attitude based on someone's perceived age doesn't yield much produc- tivity. Millennials understand that more senior professionals can often offer deep knowledge of their company or field, and through experience can provide valuable insights to younger colleagues. Likewise, teams work more productively when older employees recognize the energy and fresh ideas of those who may be decades young- er. Bringing the two perspectives together can spark innovation. ompson recalls sitting next to a young woman on a flight. "I told her I was a nurse, and her eyes lit up!" she remembers. Her seatmate was in nursing school and, toward the end of the flight, asked ompson for one piece of advice for becoming a successful nurse. "Seek out the wisdom and advice from an experienced nurse who doesn't want to eat you," ompson told her. "Find us and allow us to guide you," she added, noting that finding an older mentor has never been more crucial for professional success. Growing together Stereotyping can be limiting. Not every boomer is slow to accept change, nor is every millennial trying to make the jump from college to the boardroom in five years. Not only can leveling stereotypes based on age be unfair, but it can also leave those who straddle generations feeling left out of the discussion. Sarah Stankorb, born in 1980, is an older millennial (or young gen Xer, depending on which parameters are used) who tends to straddle the divide between stereotypes. e Wyoming, Ohio, councilwoman and writer, who was at a loss to describe her unique gen- erational attributes, coined the term Xennial in a 2014 article for GOOD magazine. "I felt too sullen to be a millennial but not sullen enough to be a gen Xer," she explains. Stankorb sees straddling the genera- tional divide as a strength. "Xennials can serve as interpreters of sorts, like good middle children everywhere who are adept at understanding the more extreme per- sonalities of their older and younger sib- lings," she says. Boomers who can locate older millennials in an office crowded with younger faces may find a compassionate, serious professional ally with whom they can skillfully navigate the workplace. 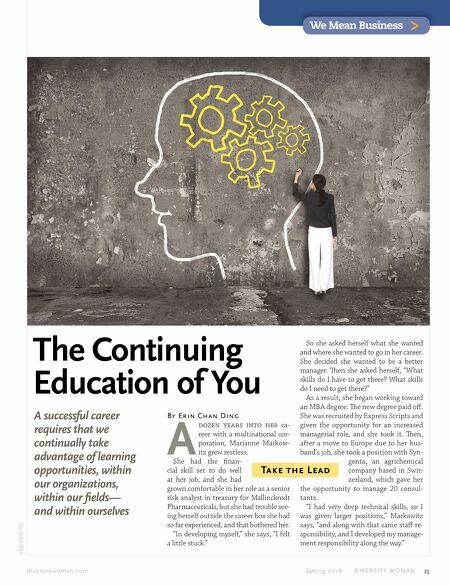 Next-generation partnerships Being successful in nearly any professional environment requires many of the same skills and attributes that are generally use- ful for pleasant, productive relationships: empathy and mutual understanding, culti- vating curiosity instead of dismissiveness, and checking assumptions about how the other person communicates and works. At Utah's NPR station, Ritchey adds that working with colleagues of differ- ent ages has been more rewarding than she could have anticipated. "I've learned that having a little patience when mak- ing changes, for anyone of any age, pays off," she says. DW Brittany Shoot is an Xennial journalist who mostly works with gen Xers. Find her online at brittanyshoot.com.